Two countries, five cities in 5 days done! A whirlwind yet very productive trip. In case you don’t know, I am a corporate recruiter for an international design firm, specializing in architecture, interior design, civil engineering and graphic design. The company has fourteen offices throughout North and South America and I am responsible for recruiting all levels of employees for each of these offices, interns through Director level roles. I’ve worked with the firm for over ten years, eight of which have been telecommuting from home. Some days I don’t like working, but every day I love my job. My travels are the result of university recruiting efforts to find architecture and interior design interns and new graduates for each of our offices. This past week, I visited our Toronto office and supporting universities: Humber College, University of Waterloo, and Ryerson University. After the job fair at Ryerson University I caught a late night flight to Columbus Ohio where I spent the night before heading to an internship fair at the University of Cincinnati. The last leg of my trip was visiting our Denver office and the University of Colorado at Denver. Having the gift of gab and being a freak magnet, this post is dedicated to the most interesting people I met on my journey. Toronto’s downtown is reminiscent of New York City but on a smaller scale. 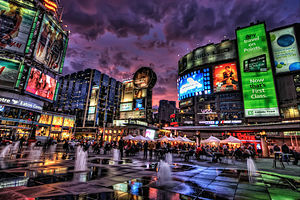 Dundas Square, near Ryerson University, looks like Times Square, Canadian-style. One huge advertisement of HGTV’s Property Brothers made me smile. Picture me with my roly-cart filled with brochures and other recruiting propaganda in one hand, and in the other hand, carrying my banner display (5″ x 5″ x 53″), half lost, half walking straight toward my destination when a guy, most likely homeless but with coveted transportation, approaches me and asks apologetically if I could buy him a cup of coffee. We were near a street vendor selling coffee. I don’t like handing out cash but I appreciated his targeted marketing approach and bought him his coffee. Which, by the way, took me ridiculously long to do since, unfamiliar with the Canadian monetary system – bills are mainly 5, 10 and 20’s. One and two dollars are coins, plus all the other coinage. Jingle jangling my coins, I successfully purchased this man a cup of coffee without incident. A very non-threatening downtown environment. Kudos Toronto! Toronto is a melting pot of international students. At one university, I met a Middle Eastern man, named Mohammad, that had his hair and beard trimmed in such a way, that along with his hawkish nose, was a striking resemblance to Abraham Lincoln. He wasn’t tall, and I was tempted to mention the likeness but chickened out. I met another man of Indian origin studying civil engineering. He had dark brown skin and shaggy black hair, who had incredible eyes the color of blue crystals, . While we discussed opportunities at my company, I was so distracted by his eyes I had to interrupt the conversation to ask if his eyes were truly that blue. He laughed and said it was “a genetic impossibility” (it’s funnier when you say it with your best Indian accent as he said it to me). Turns out he was wearing colored lenses. Recently having read, The Bluest Eye by Toni Morrison, I was intrigued that he chose to change his eye color. Columbus and Cincinnati flew by so quickly I hardly had a moment to think let alone time to meet anyone of interest. People from Ohio always rank high as the nicest people in the US. I’m not saying that because I’m from Ohio either. Ok, maybe I am, but aside from me, Ohioans are very nice. My mind was pretty well gone by the time I caught my flight out of CVG, Cincinnati’s airport located in Kentucky, to Denver. For the most part, I am a good traveller. I do what I’m supposed to do, sit where I’m supposed to sit, be where I need to be. For this leg of my journey, with no brain power, I sat in the wrong seat once I boarded the flight. Not entirely wrong. I sat in the correct row, just in the “B” seat, not the “A” seat as assigned. An elderly gentleman approached the row and, with an English accent, said “Madame, you are in my seat.” Flustered, I didn’t realize or understand my error, so he told me, basically, to scoot over one. This guy was an interesting sight. Approximately in his early 70’s, wearing khaki pants tucked into knee-high black leather boots, a white turtleneck shirt, with a khaki vest and black Greek fisherman hat. 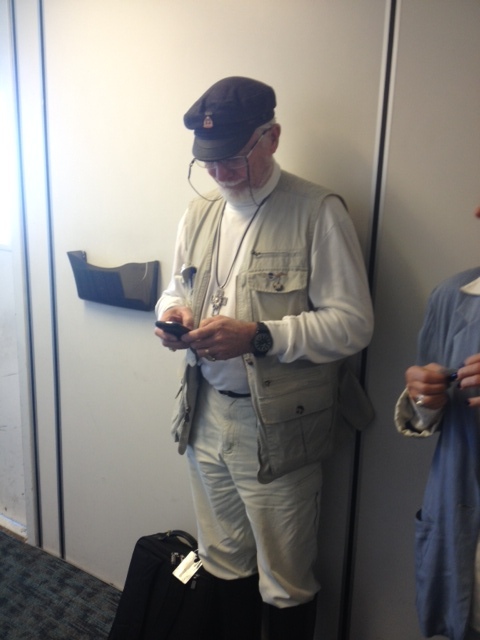 Pinned to his vest were flight wings labeled, “Tasmanian Air Club.” We spoke only briefly before he fell asleep. When he awoke we shared why we were going to Denver. He told me he was being interviewed in Colorado Springs. He had just left a speaking engagement at Asbury University in Wilmore, Kentucky. Based on what he had told me and his outfit, I couldn’t figure out his topic of discussion or interview. I had to ask. He told me his field is Applied Christianity. Internal groan, I thought for sure he was going to hit me on the head with an evangelical bible at this point. I did notice at this point that a large 3″ cross around his neck, bedazzled with black crystals. He told me he lives on the island of Malta and would return the next day. Then, what he told me next, blew my mind. Turns out this old man was Douglas Gresham, stepson to C.S. Lewis and movie-maker extraordinaire. No bells ringing yet? C.S. Lewis wrote The Lion, The Witch and The Wardrobe. Narnia. Dougie, (yes Mr. Gresham, I know, but I’m still not connecting the wardrobe with The Wardrobe so we’re keeping it friendly), told me that he was born in New York, moved to London after his parents’ divorce, mother married “Jack” aka CS Lewis who adopted Douglas and his brother, Douglas married Merrie and they moved to Tasmania (aha the pin!) where he farmed and was a bush pilot. They lived in Australia before moving to Ireland and establishing Rathvinden Ministries. Mr. and Mrs. Gresham now live on Malta where he produces movies and she is an evangelist. Turns out his bedazzled cross was designed by his daughter who is a jeweler. The black crystals are black diamonds, of course, silly me to think he picked it up at Walmart in Kentucky. He wore several rings, two of which were also designed by his daughter, both sporting a Narnia theme, one with Reepicheep the mouse, the other, along with the cross, Aslan. We found common ground discussing two of my favorite topics, gardening and jam-making. His vegetable garden supports he and his wife and two missionary families. Once he returns to Malta, Douglas and Merrie will visit their home in Australia (his island, he called it) mainly because the mangoes will be ripe and they want to attempt mango jam. We also discussed his olive trees on Malta and how they put up 56 jars of olives last year, this year they will attempt olive oil. We were trapped in our seats for 20-30 minutes on the tarmac in Denver waiting for a gate to become available as we were punished for arriving early. We had a terrific conversation and not once was I beaned with a bible or even questioned on my religion. He was thrilled to learn of my four children and their appreciation of the C.S. Lewis stories and the love of Mr. Gresham’s work. Go ahead and google Douglas Gresham. A very fascinating gentleman. I snapped this photo as we were waiting for our carry-on baggage that was checked at the gate. My day in Denver was good. The folks at the University of Colorado Denver were great. Our Denver office is always one of my favorites. I was also able to squeeze in a quick visit with some friends that Vince and I love dearly. My trip ended well, despite the slight bump in Denver airport where my departing flight for home was delayed an hour and then the lid of my extra hot tea popped off and burned the heck out of me. After waking up at 6 AM eastern standard time, I was delirious by the time I got home at 12:15 AM pacific standard time. A long but adventurously good day. My favorite part about my trip, beyond the sights and travel itself, was and always will be the people you meet on your journey. I think that Abraham look-a-like might be me, I get that a lot. We met at Ryerson University in Toronto. Great blog by the way. How do you remember all these minor details from your day? Thank you! I appreciate you reading my blog! I’ll be in touch regarding hiring opportunities. I hope I didn’t offend you by referencing your likeness in my blog. The minor things add up to major things. There are very few “AHA” moments in life, you have to appreciate the little things. Au contraire, I’m happy to be remembered in such a distinguished manner. You make a good point in your last sentence. It’s always the little things that remind you to smile and laugh.